I’ll forego the usual introduction. You all know we’re at a bar. Today’s gallery includes some photos from my dark commute. If you want to see some color, check out Chery’s place. Leaving our neighborhood on a foggy day. I always like how the speed and nature of the water changes the reflection of the Colt Dome. Looking south from Great River Park (using my camera’s night landscape scene setting). My photographer friends might appreciate that I used manual settings and a mini-tripod to get this photo. That’s a 4-second exposure. The dock has finally been removed from the river. This building was gutted and is being rebuilt. That’s the park entrance road. The sun is starting to rise as I get close to our office building. Hartford from above the levee. My coworker must be running late. She usually turns the lights on. That’s our Christmas tree. Literally straight in front of my office. Short days mean I get to see some sunsets as soon as I get home. We live close to the airport. “I brought you a toy, are you gonna sit with me?” Yes Maddie – I’ll sit. I usually sit with Maddie for 25-30 seconds before leaving for work. She’s just crossing “sat with dad” off the list. I thought I’d show Faith how to get a selfie with Maddie. I’m behind her. Another five-yr-old photo of Maddie that Facebook reminded me of. Once upon a time the term was bar fly, but I like bar folk better. Many a good person has dawdled at a bar. I’m not sure I’d like being called a bar fly, but if it’s meant well, I’m good. Thanks. Love your ‘close to the airport pics, so I thought I’s show you out my back door the other day! Thanks. I’ve been out all day. Sorry for the delay in approving this. Thanks gif sharing such an amazing sky. Not talking to some folks while enjoying talking to others reminded me of how we use to talk to fellow travelers and have interesting conversations. Now, people put ear buds in to make sure you get the message that they have no interest in talking to you. Who knew two dime-sized items would have such an influence on how we interact. Hey, maybe you need a pair in your coat pocket that you can just put in as you arrive at work at a busy time. :-) Love those ‘young’ Maddie shots. You’re right about the ear buds. I saw someone a few weeks ago sitting at a bar with earbuds in. There should be a law. I don’t remember posting so many baby-Maddie photos, but I guess I did. I love having a regular Pub where I am known. It’s comfortable. And in a world of uncertainty that means a lot! It’s do true. It’s funny, but I have several of these, in cities I travel to regularly. You know, Dan, sometimes I have a moment of difficulty deciding who is the focus of conversation between you and your persnickety, ummm, discerning, friend. Lol. In this instance, although I would stop short of walking through wet grass, I completely agree about making the difficult entry into the workplace, aka, dungeon of dread, alone. Although our building has nine floors and we occupy the top two, there is relatively little going on elsewhere in it since the big company (who shall not be named here) moved out. However, on the fourth floor there is some business I know not any details about except that all the employees are aged average 25 or younger, have no manners, dress like they are on their way to an interview with GQ or Elle magazine and apparently consider me/us on the upper floors to be mere caca on their designer boots. I assume they are IT (sorry) related jobs since they are always loaded to the max with computers and other devices. I wil sometimes slow down to wait for another elevator just to avoid the scrunched nose which is always pointed at their cell phone, their bodies pressed against the farthest wall, holding their breath lest I speak. And on those days when I am feeling devilish I do. I love making them speak. Have a good day seems to elicit a quick, confused “Thank you” as they depart with much relief. Sorry ladies, but the gals are far worse than the guys. The fellas will often engage, perhaps because I remind them of their Mom. Who knows? I don’t want deep conversation at 7:30, just a bit of human decency, like eye contact. I mean they chat like little stupid mice to one another all the way up. The things I hear……🙄 And you are right about bar folk, especially those that actually sit AT the bar. We always make friends that way. Thanks for being such a great patron and tipper, Dan. I read and reread these posts to try to clarify who’s speaking, but I struggle sometimes. We’re only on the 3rd floor, so a I almost always take the stairs up and down. I only take the elevator if both hands are full. We have some new companies subleasing space on our floor. They are clearly IT folk (I understand) and you can derail them with a hello and a little eye contact. I do sit AT THE BAR, and I will talk to anyone and I take care of the bartender (even Skippy). Thanks! I like the term “bar folk”. It’s user friendly compared to “bar fly” or “bar people”. When I worked, I always arrived early to be able to park in ‘my’ space. The tree nearby shaded my car from the summer sun, it was easy access to where I worked, and the guys who parked in that area shoveled me out in the winter! Perfect!! Thinking about parking in ‘my’ space? Fageddaboutit!! Love all the reflection pictures. And those sunsets are breathtaking. And Maddie and her shamrock. But puppy Maddie…..her expression says, “What’s in your hand? Are you taking my picture again! Please let me know next time so I can comb my hair!” Little did sweet Maddie know that she would live in front of the camera! And lucky for all of us who are addicted to this beautiful redhead. Thanks Ginger. Parking is a disaster where I work. There are two large lots, but they are shared by two office buildings and a hotel. If the hotel is crowded, early birds are faced with all the good spots in one lot still occupied. I park in the other lot, but it’s by permit only and only five of our employees have permits. (I gave them out, and I gave them out in order of arrival). Some of Maddie’s puppy pictures told us there was something different about her. She didn’t always seem to understand what was going on. She still gets that way these days. We don’t know if she’s having mini-seizures or if something else if going on between those pretty red ears. She asks to go outside, we go out and she looks up as if to say “why are we outside?” – We’ve learned to just take her back in at that point. Ha ha – I loved doing things like that – like mooing at cows. Kids don’t understand that when they want us to stop, we want to do it more. I am a creature of habit, but you’re right, I don’t have to worry about where I parked. I get into work at 9 so ‘my’ spot is most always there for me. I park way at the end of the parking lot so I can brag that I ‘walked’ into work. A couple mornings ago my spot was taken and I had to park closer to the front. Ugh. ruined my day. You’re using a tripod now?! Dang. I gotta get with the program and try that. Ha ha – I only get your spot on the days I have to run an errand at lunch. I almost never do that. I have always carried a mini-tripod, but I rarely use it. I got mad at my camera trying to put more light into the pictures than was really there. I wanted to get one shot that looked like what I was seeing. It is why I like living out in the stick. Lots of free parking. I was looking for a particular INTJ meme to reference here, but I can’t find it. Now I have nothing clever to say 😏 … except from one INTJ to another, I get it! Thanks Joanne. We know our weaknesses, but we’re good bar folk. Thanks John. I think it’s only worse in the morning, when it’s just you and that whiny guy in the lobby. When I worked in consulting, the lobby and elevators were always crowded. I think that was easier. Maddie hogged that selfie pretty well. She would rather not share the image (unless with Faith). 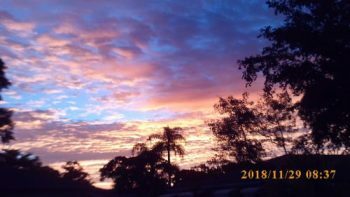 Love your beautiful sunset shots, Dan, and the discussion about parking spots and interactions with others. If we go by Myers Briggs, I too am an introvert (INFP) and I definitely like my “me” time. As for parking, I am definitely territorial about that–I get mad if someone is in the spot I usually use, which is far from the building. I note that there is a core group of people that park at the fringe areas of the parking lot, presumably to avoid dings,while many others fight for the close-in spaces. I’m glad I’m not the only one with “my” space, Mike. My problem is that we are only allowed to park in certain spaces in this lot, and a lot of them are less than ideal. The sunrises are later and the sunsets earlier, but we have seen some pretty ones. I’m glad you like them. Anyway, parking is clearly important to me. Oh my goodness. How do you not know you are blocking another car? My coworker and I joke about bringing road cones to mark our spots. We share this lot with other buildings, and it’s not a good working relationship. Parking at the bar is awful. The spots are vary close together and, well, it’s a bar, so the people leaving are not always the best drivers. Oh that IS a pity. Some areas, we avoid going because of parking. Well, my husband does. He hates paying for it more than I do and he really hates hunting for spaces. I’m with him. I’d willingly/grudgingly pay if spaces were easy to find. Bar folk are the best. Your gallery is stunning, especially the colorful skies and adorable fur babies. I have a similar parking idiosyncrasy but more for the ability to back out safely when it is time to leave versus people I might see. Our parking structure is tight, you almost have to be a stunt car driver to maneuver it. No one is around when I get there in the early am, seeing someone would really be a shock. Oh my goodness, reading the words “back out” sent a shiver up my spine. I always back in so I can pull out. Before moving into this building, we parked in a garage like you describe – that always put my blood pressure up a notch or two. Your “I” makes perfect sense to me. I don’t think I’d want to talk to any of your annoying people no matter what time it is! Ha ha! I never thought about that. I just know I don’t want to talk to them in the early am. Most always, I am the first to arrive at work (on our side of the building). I walk in by myself, trip the motion lights, turn on the computer and make a first cup of coffee in peace…unless my boss shows up early because he has to be in Madison by 8:30. And I would not mind walking in with him because he’s not one of those people you mention above. On the other hand, if I came in early and I saw a tall IT guy who always walked across the grass and didn’t seem to want to say hello, I’d probably go out of my way to engage. Because I’m like that. Then again, you’d probably talk to me because I’m not one of those people you mention above and I love beer, football and bicycles. Go Steelers! GoPackGoNextYear! I would talk to you! Actually, there is a guy, a lawyer on the 2nd floor, who I will go out of my way to talk to. He’s just a really nice guy. Mostly, when I get to work, I just want to get in, get my coffee and get going. I hope we can put a December streak in gear tomorrow. 9-6-1 could get you in a wildcard slot. Lots of winable games ahead (if you can beat the Bears). GoPackGo! This makes perfect sense to me, too. Who wants to talk that early? Having our own parking place probably relates to when we had assigned seats in school. It happens in church, too, but if someone is in your place in church, you have to be nice to them and let them sit there, especially if they’re new. It’s funny that you mention church, Joanna. My brother and I and my daughter went to my mother’s church the Sunday before her funeral. We knew a lot of the people wouldn’t be able to come to the services. We were planning to sit in the back. Faith and I had been there before. The minister’s wife recognized us and said “you’re Betty’s kids – oh, you have to sit in her pew.” And she asked the people sitting there to move over :-) She had been a member for 75 years. Sounds like the minster’s wife was very confident and wanted you to feel welcome (?) You mom must have been well loved. My mom’s name was Betty by the way. It was nice of her as it meant we got to sit near the people she normally sat near. The best part was that my brother and I had gone to Sunday School with a lot of those people. She always liked her name. She would point out that it wasn’t short for anything. My mom’s name wasn’t short for anything either, though people often assumed Elizabeth was her real name. Betty must have been a popular name in it’s on right back then. I counted a lot of “ma”s amidst the bourbon and blue cheese and the karma! That is a dark commute but a colorful sunrise through the trees. Stay warm. Thanks! It’s only dark for another month, and then we start adding daylight. You took a stunning collection of photos for this post, Dan. Mega hugs. Corona ? To each his own. Ha! I’ve settled into Corona in a slow walk away from heavier beers. I can’t consider “light” of any sort, but this goes down easy. Well done, Dan. I really enjoyed the read! I loved your exposure of 4 seconds on a mini tripod morning shot of the skyline and reflections in the river!! Your sunsets were gorgeous on those days. I like to park in the same area, but not necessarily the same spot at the places I frequent the most. I prefer to back in, but I don’t always. I like the quicker, safer get of the parking spot aspect of backing in. Thanks Deborah. I was frustrated with the way this camera wants to add light to night photos. It takes a lot for me to venture into the M-manual settings mode and dig out the tripod, but maybe I should do it more often. I either back into a parking spot or pull through two spots so I can pull out going forward. The exception is in the lower lot of this bar, because where I park, I can back into a shuttle drop-off (they are near several hotels) where there are never any cars. Parking is such a huge issue in India. I mean we don’t even have wider streets and people keep buying these huge SUVs that take up all the space. Secondly, there is hardly any civic sense cultivated so people park their cars wherever they fancy, sometimes even on the road. This is why I prefer to stick to public transport like trains and buses. If I have the budget I would call an Uber. Maybe in the near future I would buy a scooter for grocery rounds. It’s hard for me to imagine cities worse than New York or Boston, but I understand that your traffic situation is much worse. I don’t envy you that, but I do envy the public transit options you have. That was fun and funny! You are going to be an interesting person to read. I can see that already! Thanks you so much for that comment. I hope I can live up to it. I’m optimistic that you will!